Protesters in more than a dozen European states have taken to the streets in scheduled demonstrations against the yet-to-be-approved CETA trade agreement, charging it will result in the loss of jobs, lower safety standards, and grant freer rein to corporations. “The people and the planet are not merchandise,” read a banner carried at the front of a column of demonstrators in Madrid. In Dublin, protesters dressed as politicians from the ruling Fine Gael party handed over a “blank check” to a man dressed as a “corporation,” wearing a skull mask. A procession of 130 tractors and as many as 18,000 people marched through the heart of Berlin before symbolically handing over a petition at the German agricultural ministry. The demonstration, organized by Germany’s Green Party and environmentally-conscious farmers wasn’t exclusively aimed at CETA, but the treaty received prominent mentions in the list of complaints. Other notable rallies, documented on social media, were staged in Paris, Madrid and several other Spanish cities, Ourense in Portugal and Brussels. TTIP, and TiSA, two other unratified pro-free trade treaties were also condemned. 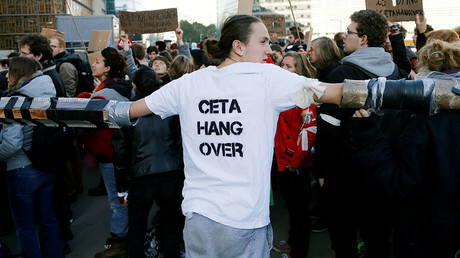 The broad coalition of anti-globalists, environmentalists and labor movements that was behind what they called the Decentralized Day of Action against CETA, which had been negotiated for seven years, prior to being signed last October, outlined three main objections to CETA, the Comprehensive Economic and Trade Agreement. The first was regulatory harmonization between Canada and the EU which would mean goods are produced to the same standard, and can be easily imported without additional certification. 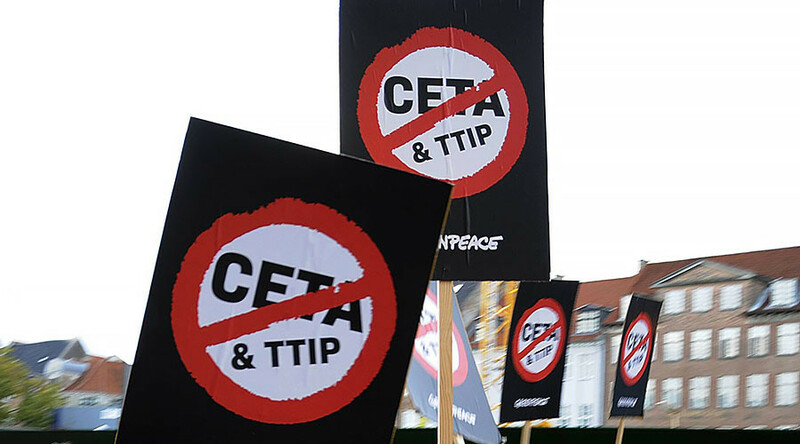 “With the excuse of improving trade between the countries, regulations designed to protect the environment, workers' rights, public services and consumer standards, will be reduced to the minimum common denominator,” said StopCETA.net. The second is the additional legal protection given to foreign investors. “Multinational corporations will have the right to sue governments if laws or regulations are introduced that cause them loss of profits,” continued the organizers. And the third argument focused on the secrecy of the treaty, which was negotiated behind closed doors, and which will need to be ratified by the European Parliament this spring, before being approved by the national legislatures of the 28 EU member states. Proponents of CETA argue that it will boost trade between Canada and Europe by 20 percent, and annually add €12 billion to the EU economy and €8.4 billion to Canada’s economy. After several decades in which trade barriers were removed by governments with scant consultation with the public, there’s been growing resistance to new agreements from both above and below. The Transatlantic Trade and Investment Partnership (TTIP), a deal similar to CETA, but involving the much larger US economy, has also been met with fierce public resistance in Europe, and Donald Trump has signaled that dismantling TTIP is one of his priorities as President of the US. The Trade in Services Agreement (TiSA) that plans to open up the service industries of 23 mostly developed countries to foreign companies and individuals, has gone through 21 rounds of negotiations since 2013, with no final document published yet, and no deadline for the end of talks.